I've been waiting for a chance to show this wild hair that is the Mau and Mej gift at Savoir Hair, but it really needed a skin with a hair base. Add the skin gift from Fishy Strawberry, and these items from the lucky chair (also available in the camping chairs) at Atalante, and the character came together on her own. Outfit: “Honey” lucky chair and/or camping chair prize at Atalante includes boots, shrug, bracelet and necklace. Two skins available as group gifts at Imabee. Make sure you are wearing your group tag and click the posters to receive the skins. Izzie’s is having a small Easter hunt. Five baskets in all to find containing these two cute outfits and 12 poses, each basket is 1L. Skin: “Light - Vivian Ate My Golden Watch” group gift at Imabee. Skin: “Pale - Vivian Couldn't Sleep” group gift at Imabee. Note - skin does not come with rabbit teeth, those are a hunt gift from Izzie's. Even roleplayers can go green for St. Patrick's Day. Skin: "Aimesi Skin Lisa Cream St.Patrick" in store group gift. Wear your tag and click the sign at Aimesi. Comes in three skin tones. Hair: "Nyanotech 09-1B Hair - Elementia V2" in store group gift. Wear your tag and click the sign at Curious Kitties. Outfit: "Andromeda in Green LC Edition" new lucky chair item at Roawenwood with multiple wear options. Hair: "Exile Susan toxic" of one dozens of hairs created by designers from across the grid that are available for free or 1L at the newly reopened Savoir Hair. The Chase the Beast Hunt is all about fables and animal tales which is perfect for roleplayers. Hunt starting location is LouLou and Co Mainstore, includes 53 locations and lasts until April 1st. You are looking for a scroll which will contain the prize and the LM for the next store. See the organizers’ blog http://loulouandco.over-blog.com/ for a list of hints and more pictures of prizes. My favorite part of this hunt is that many designers included a notecard about the fable or tale they chose as a theme for their gift. Bounce Designs female red fox skin, ears, tail and anime eyes. Also includes, but not shown, male fox skin and Maitre Corbeau (Crow) to wear on your shoulder. Acide and Mala fantasia blue skin and Elven ears. Also includes Fantasia blue shape which is not shown. House of Ruin exclusive skin called Cabal: Raven & the Sun in three tones. Palomino is the lightest and shown here. A big thank you to everyone who responded to my frantic calls for help in various groups to lock down these prizes. There are two complete avatars on the midnight mania boards at Hanit. 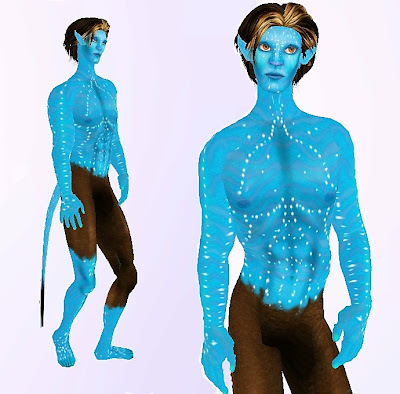 Male and female complete with blue skin, shape, tail and ears. I can only show you the female version. The dash to lock down caused some lag and we didn’t get the men’s version in time. It sat at 182/200. Hair: “Connect - Black A” one of 14 fatpacks available free at Magika. Outfit: “*Defiant* Panther Gear” Midnight Mania prize at Feral Designs. Skin, Shape, Ears, Tail: “blu'e female” Midnight Mania prize at HanitStore. Will add a picture of the male version if I win it.